Discussion in '1st Gen. Tacomas (1995-2004)' started by buzzard1992, Sep 26, 2010. 3'' OME lift, Deck plate mod, spidertrax wheel spacers, 12'' alpine type S sub. STLharry Lube: It's the key to penetration. 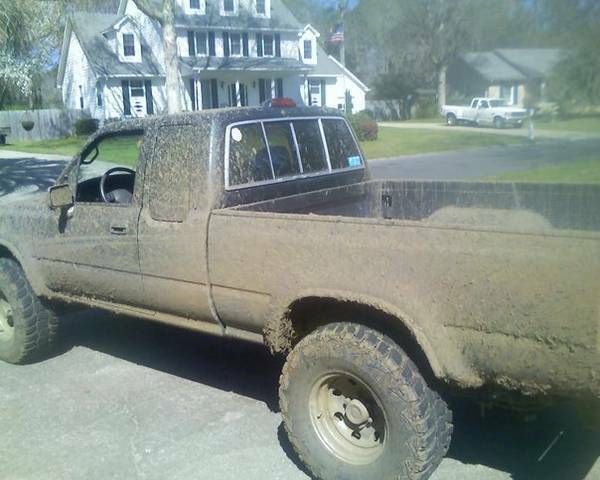 The new truck is going NOWHERE NEAR mud like that though. Bad stuff...gets everywhere and ruins everything. My truck is now a work truck and a trail truck. No more mud pits. oh and you makin any progress with your truck/lift/tires? nice always liked the white ones with the black flares, what type of lift? Ive never been, and I dont think I will especially now when I have an innercooler pump sitting near the bottom of my bumper. so your getting rid of that to get a taco?